Interactome3D is a web service for the structural annotation of protein-protein interaction networks. Submit your interactions and the server will find all the available structural data for both the single interactors and the interactions themselves. Additionally you can also visualize and download structural information for interactions involving a set of proteins or interactomes for one of the precalculated organisms. If you have any doubts read our section of Frequently Asked Questions. Enter a list of interactions (max. 10000). Every interaction has to be entered in a separate line, as a pair of space-separated Uniprot ACs (*): Uniprot accession codes. If you don't know about Uniprot go to https://www.uniprot.org. ...or upload your interactions from a file: Every interaction has to be entered in a separate line, as a pair of space-separated Uniprot ACs (max. 10000). Enter a list of Uniprot ACs (*) or gene names: Uniprot accession codes. If you don't know about Uniprot go to https://www.uniprot.org. (*) Please notice that the current version of Interactome3D runs on Uniprot version 2019_01. Uniprot ACs that refer to alternative isoforms will be converted to the canonical isoform. (**) The server will send you an email when the results are ready and a link to visualize and download your data. 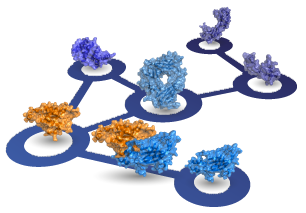 Interactome3D is provided by the Structural Bioinformatics and Network Biology Group at the Institute for Research in Biomedicine. Please contact interactome3d irbbarcelona.org for any question/suggestion. Last modified: 28 September 2017.